Two Seward HS Seniors received scholarship awards from the Seward Optimist Club at Honors Night on May 8, 2018. 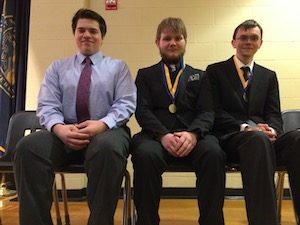 The Optimist Club provides these awards to selected seniors who have participated in Optimist Club projects and/or competitions. The awards are given through the Seward Community Scholarship Program. Elias Stillahn (left) and Christopher Galusha (right) received the community scholarships. Thomas Bosmenial was the recipient of the NE District Optimist Oratorical Scholarship in 2017.